Hello and Happy Tuesday! I hope you are having a wonderful week! 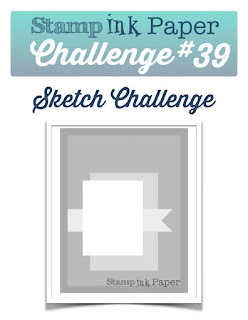 Since it is Tuesday, it's time for another Stamp, Ink, Paper Challenge! This week we have a fun sketch for you! I know this is a complete shocker for anyone that knows me but this week I'm back with the Traveler set! I know, I know, I'm obsessed with this stamp set! Almost every sketch I look at speaks Traveler to me. I try to fight it but I keep getting sucked into this world of trains, and ships.. oh my! Lol This week I paired it with the ledger stamp from The Open Sea as well as the retired stamp set.. That's the Ticket! Here's my take on this sketch this week! This one started with an 11" x 4 1/4" piece of Basic Black cardstock that was scored at 5 1/2". I added a piece of 4 x 5 1/4" Basic gray cardstock that I ran through my big shot with an awesome Darice Diamond Plate Embossing Folder. 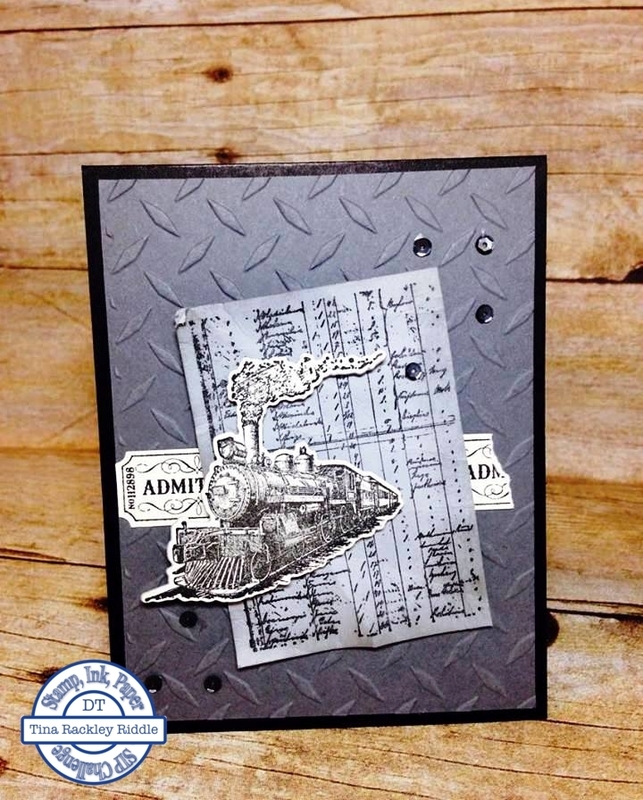 I adhered the embossed layer with Multipurpose glue and stamped my tickets onto Very Vanilla Cardstock with Memento Tuxedo Black Ink and punched out the coordinating Ticket Duo Punch. I glued three end to end onto the gray layer and tore the third one prior to glueing. I stamped the ledger from The Open Sea stamp set in Memento Tuxedo Black onto a piece of 2 1/2" x 3 1/2" Smoky Slate cardstock. After stamping, I sponged Smoky Slate ink on the edges and then crumpled it up into a ball. Yep.. I crumpled it up! lol Then I opened it back up and tore away at some of the edges to distress it and then adhered it with foam tape over on the ticket strip. 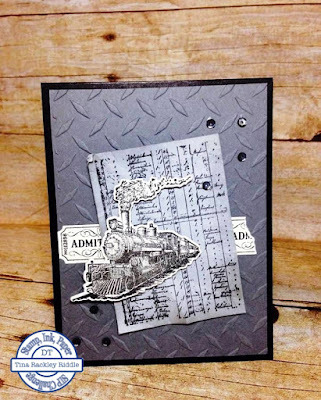 I stamped the train from the Traveler set onto Very Vanilla cardstock with Memento Tuxedo black and used my Dies By Dave die to cut out the image. I absolutely LOVE that Dave makes these dies for my favorite stamp set! I adhered my train with more foam tape and then glued a few charcoal sequins from Pretty Pink Posh onto my card. I decided not to use a sentiment on the outside and have stamped the "Sending Wishes Your Way" stamp from Butterfly Basics set on the inside. Maybe you are stuck on tracker because you are wishing...hoping...for an over due vacation.....great card !! !